Dutch air force days 2014. Thread: Dutch air force days 2014. This weekend also marked the end of the long history the KLM had with Douglas aircraft (The KLM is the only airline to operate all types from the DC-2 to the DC-10/MD-11! ), as this MD-11 did the last passenger flight from Gilze-Rijen to Schiphol with a group of sick and disabled children. Gorgeous photos, Ferry, thank you for sharing them! Is the SKHV Spitfire NH238 a flyer, or soon to be? I like those interesting colors/markings - something different than the usual RAF camouflage. Also neat to see a Spitfire today with under-wing loads. Thanks John. I did some more research but (And they really fooled me!) this is not a real Spitfire but a plastic replica! The real MH238 is apparently still in storage in England somewhere. The real one served with the Dutch AF in the Indies, was later sold to Belgium and to Britain. At some point it even belonged to the Confederate Air Force before being sold to Britain again. As always, it's great to see the Catalina, B-25 and silver Spitfire active. It's always a pleasure to see our old aircraft fly John. Others that flew were the DHC-2 Beaver with a pair of Harvards, an Antonov An-2 and a P-51D Mustang. Great stuff, as usual, Ferry. I particularly like your shot of the Arrows formation - and those crazy choppers.....brilliant ! That is a shame about Leuchars Mike, and sad to hear there will be no more airshows! Money is running out fast all around the world's defensive forces it seems, this year's show was quite meager. Just two display teams and five solo display jets, a quite a few slots filled up with private organisations. Our 'Hawk 1' Apache demo flew twice on Friday just to keep the show going.. Since working in retail also on weekends I really miss these events! BTW. 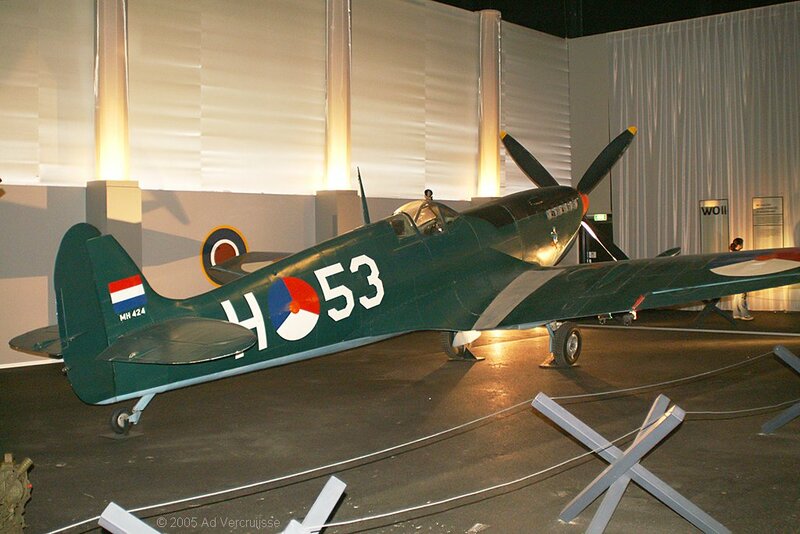 the SKHV Spitfire Mk.IX NH238 replica looks quite interesting, cause I´ve never ever seen this colorsceme, especially the turqouise-green fuselage color. Thanks Alex! I always take a few days off from work just to visit both days! You may remember this Spitfire (http://www.aviator.nl/images/H/H-53-...CT0030-big.jpg) from the Aviodrome museum which was a Mk.IXc MJ271 painted as MH424/H-53, sold to the Historic Flying Limited (HFL) at Duxford a few years ago, and should be flying again in the future. Nice pics Ferry! The Reds were just perfect on friday. I've never seen a more perfect heart and spear before. Sadly, the remainder of the program was a bit standard. Most of the times before, the same program was 'spiced up' with some spectacular extra, but no-no this year... I remember the tremendous Vulcan display on Volkel 2009. It was great! Thanks for these great pictures Ferry. I realy like the one from the (plastic) replica. I had seen pictures when it was partly sprayed, but I never for the replica when it was finished. For those who are wondering about the Spitfire colours of the (plastic) replica. Most of the Spitfires used by 322 squadron in the former Netherlands East Indies during the period 1947-1948 were painted in this scheme. The top colour was called "Jungle green" and lower surfaced were painted "light blue". However the the H-64 was painted overal light blue and the H-60 was painted in a camouflage scheme. A medium gray pattern was painted over the "jungle green". Thanks for posting these great fotos! That guy flying the Dreamliner - flying the Katana - flying the Bucaneer seems to have it al, doesn't he! Wow, there are some spectacular photos in that collection. Love the Apache and F-16! This former Lelystad resident popped out of storage at Duxford today, and I immediately thought of this thread. This is the first time it has been seen in public since February 2007, and owned by Historic Flying Ltd., hopefully this is a sign that the aircraft's intended restoration to airworthy will be starting. 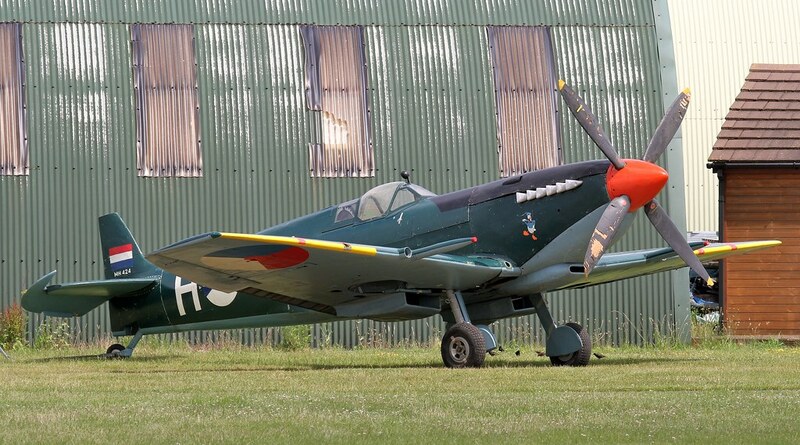 The aircraft is Spitfire LF.IX MJ271 painted as MH424/H-53. Photo by David Witworth via the Key Publishing forums.